Replies: 79 (Who? ), Viewed: 111152 times. ATTENTION!!! This plugins was compiled for MilkShape 1.77 and above. Older versions are not supported! ExtendedManualEdit is extended version of classic MilkShape's Manual Edit. This version was oriented on GMDC meshes (only one UV and one normal per vertex supported) and allow manually edition (per vertex) of XYZ coords, UV map coords, vertex normal coords, all 4 bones assignments and their weights. Additionally "show selected only" and show only selected bone assigned vertexes added. All configuration stored into registry on exit and restored on next restarts! editor selection also (thanks to Wes_H). msAlignNormals is helper plugin, which allow manual per-vertex based smoothig and renormalizing operation. Istruction attached. Please post notes and Your minds about this realisation and interface style here. Well, I have tried it and it works. And looks very nice, too. I will report to you here if I uncover any anomolies in it's performance. Well, so far I like it more every time I use it. One difficulty that you might help overcome would be to help edit the normals, too. These are difficult, because in the new MilkShape SDK interface, there are three normals per triangle, regardless of shared vertex status. I think by selecting and copying values from different areas, some of the shadowing problems could be helped. I like your tool very much, this type of tool is what I'm waiting for. You should post this tool to Milkshape website too, instead of just here it is a universal tool. Anyway, there is a bug I want to report to you. Might be you forgot about this. When editing any vertices that have few UV map coordinates (UV Map coordinates share 1 geometry vertice), your tool only recognize 1 UV map coordinate and resulting the lost of the another UV map coordinates. I've checked in Milkshape, every vertices that has several UV coordinates will represents in different vertices. Another thing you should add three more column of XYZ normals for every vertices as per suggestion by Wes. Make them editable. Your tool will be a perfect tool when you remove the bug and add the feature. Anyway I give 5 stars. Its really amaze me. support only one UV and one normal per geometric vertex. Into new MilkShape API this cause all normals and UVs for all triangles corners, connected to some vertex, are equivalent. My editor read first occurence of UV for current vertex and show it, and after change UV value new values assigned to all connected triangles corners. Of course, this method are not universal, but worked for GMDC export tools and allow avoid unpredictable lost of multi-assigned UV coords on export operation. May be You see another way? Normals edition (I do this now) support will be like UV edition - one normal per vertex with duplicating new value to all connected corners. Or I'm wrong? When editing any vertices that have few UV map coordinates (UV Map coordinates share 1 geometry vertice), your tool only recognize 1 UV map coordinate and resulting the lost of the another UV map coordinates. I've checked in Milkshape, every vertices that has several UV coordinates will represents in different vertices. Welded vertices that have different UV coordinates are not a good thing for Sims2 meshes. That is partly why I have consistently discouraged welding except under controlled circumstances. When this happens (one vertice, two UV coordinates) the exporter effectively 'unwelds' them by creating a second vertex with the second set of UV coordinates. While this corrects the texturing issue, the original second normal was lost when the weld occurred, so both vertices share the same normal. This is sometimes a big issue at the seams that have hard turns, because the shared normal makes the shading incorrect on both sides of the seam (shadow issues). Demon is up against a tough issue trying to correct that condition, because there is a fundamental architectural difference between the way MilkShape can hold a mesh model and what a GMDC can hold [in a GMDC, there are equal numbers of vertices, normals, UVs and, optionally bone assignment/weighting sets and morph maps sets]. You might think about undoing the welding on these joints, because the exporter undoes some of them anyway (putting the vertice count back where it was), and leaves you with a less-than-perfect rendition of what you are trying to make. Oooh this may be exactly what I needed... I've been using the Poser/Mesh Tool technique for clothing meshes, and it totally hoses the normals around the bottom edges of, well, pretty much everything... I can clean them up if I Smooth All in Milkshape, but that brings out the seams. Hopefully this will give me another option. Now I add my new normals-specific plugin msAlignNormals. Please try it - this allow to save lot of time in most cases. #10 22nd Mar 2006 at 5:16 PM Last edited by 0O_Andie_O0 : 22nd Mar 2006 at 5:21 PM. These are both very nice pieces of work, demon. I was using the extended manual editor, and I was trying to alter the selected state of some vertices to visualize them. I was able to do make the state changes, but it appears that setting the msFlag to eSelected (==1) does not change the visual display state on screen (which is what I wanted to do). I can tell that your editor is changing the flag, because my BoneTool (which looks for bit0) displayed the correct vertices, even though they are not highlighted onscreen. Can you try also setting eSelected2 (==2) when the select state is changed and see if it updates the display? This would be most useful to me. Thanks for the nice tool! Thanks to your tool, your new editable normals really works, the body mesh now no longer have the shadow problem with your tool. #15 25th Mar 2006 at 7:45 AM Last edited by Dr Pixel : 25th Mar 2006 at 7:52 AM. Thanks for this great set of tools! As luck would have it, I happened to be working on a mesh were both of them came in very handy. I am trying to convert the Maid's outfit into a separate top, but ran into two problems. 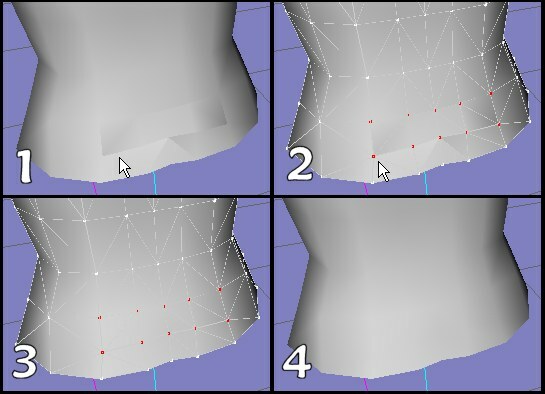 First, when making a separate top or bottom mesh, the vertices at the joining area around the waist MUST align perfectly with the positions of an original Maxis separate top/bottom or the new mesh will not work right with other top and bottom meshes. I was having trouble alinging them perfectly, but your Manual Edit tool solved this easily. 7} I am interested in aligning the x, y, and z co-ordinates of my own mesh with those of the reference - my mesh co-ordinates are on the top - I can tell because the one on the bottom has no bone assignments, it shows -1 for the bone. Result: My new mesh now works right in the game, it aligns perfectly with all the separate bottom meshes with no gaps or animation problems! NOTE: I know some of you don't like to bother with the "fat" morph - but if you are doing separate tops and bottoms, it is important that you do keep the fat morph and edit it properly - otherwise your mesh will not be compatible with other tops and bottoms in the game. I had another problem with this same mesh - the Maid mesh has a bow sticking out a little bit on the back, which I want to remove. I was able to get rid of the bow by snapping the vertices together and aligning them with the rest of the back, but this area still has the "normals" of the bow showing - this will make a weird shadow on my skins. So, I select all the vertices surrounding this area - then I use the "Align Normals" tool. This doesn't affect the rest of the normals, but it does get rid of those "bow" shadows! Wow, amazing! I have no other words Well done! @Dr. Pixel: Is the shirt up for download somewhere? and also on my Blarneystone site - same mesh, different skins. #20 23rd Apr 2006 at 4:18 AM Last edited by Warlokk : 23rd Apr 2006 at 4:31 AM. I just wanted to chime in that these work great... I've been able to eliminate ALL weird shadow/normal issues in my meshes, and everything looks great! ... except one tiny, annoying detail: the dividing line between top and bottom separates. Not a gap, just slightly misaligned normals along the join. I thought I had that licked, but it's still a problem. I'm thinking of trying a manual edit of those vertices along the top edge of the mesh, and making them match with a default Maxis mesh, since I do not modify them in any way... unfortunately there's no simple copy-paste method I can see, so it's going to be a killer with the sheer number of meshes I'm working with (14 Bottom Separate meshes x 4 sizes, just for the bottoms). If anyone has any suggestions I'd love to hear them... I also played around with the built-in SimPE mesh importer, but I can't get it to work at all, the whole mesh is displaced slightly and there's no morph support, and I can't find any tuturials at all... so I'm still using Mesh Tool for this part, since I need the bump maps. #21 23rd Apr 2006 at 5:20 AM Last edited by Dr Pixel : 23rd Apr 2006 at 5:29 AM. Although I didn't show it in my example above, the Extended Manual Edit tool does in fact allow you to copy and paste the "normals" and the uv_co-ordinates info from one mesh group to another just as I did with the x, y, and z. It helped a lot with my tops and bottoms, although they are still not perfect. I used it on the vertices around the joining area only, maybe it would be better to also do the next "ring" of vertices above (or below) the jpoining area too. #22 23rd Apr 2006 at 5:57 AM Last edited by Warlokk : 23rd Apr 2006 at 6:02 AM. Of course I have to re-do the ones I've done so far, but now that'll take just a few minutes each... thank you Doc! Never, under any circumstance, not even once in a while, is it appropriate to wear socks with your sandals.